The first character introduced in the Star Wars Expanded Universe was Grand Admiral Thrawn, the man who rekindled the Empire and was Luke Skywalker’s first post-Return of the Jedi nemesis. He became one of the most popular characters of the Expanded Universe. Then Disney bought Lucasfilm and scrapped the Expanded Universe. Yet Thrawn remains, appearing in season 3 of Star Wars: Rebels. 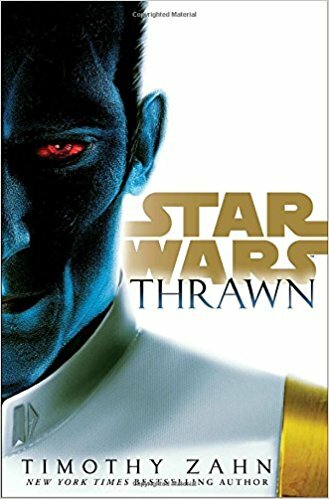 To solidify his presence in new canon, Thrawn’s creator Timothy Zahn writes Thrawn, the story of how an alien from unknown space became a powerful figure in the Empire’s navy. I listened to this on audio. Lucasfilm has tended to do its audio books as audio dramas with more pronounced voices from the readers, sound effects, and John Williams’s music. This one is no exception. Reader Marco Thompson reads Thrawn as an maddeningly calm Englishman, which is in keeping with the Empire’s human officers. ﻿ Thrawn’s story becomes intertwined with a Cadet from Wild Space named Eli Vanto. The fleet finds Thrawn on a deserted planet. He is one of the Chiss, a legendary race of warriors from Unknown Space. Curious after Thrawn gives the Empire’s best troops hell for a few days, the Emperor sends him to the Royal Academy with Vanto and makes him a lieutenant with Vanto as his aide. His rise parallels the rise of the ambitious Ahrinda Pryce, whose family on Lothall loses their mining company to the Empire. Pryce schemes her way back to Lothall to become governor (her role in Rebels) while Thrawn climbs through the Naval ranks, infuriating core world elites along the way. Through Vanto, the Empire is shown as something other than the evil entity that wiped out the Jedi. Admirals do show concern for lost lives, even of the disposable Storm Troopers. Thrawn reminds me of an Isaac Asimov character, always four steps ahead of his opponents. It’s said by others in the story that Thrawn is poitically tone deaf, but he doesn’t need politics. His successes speak for themselves. If anything, Thrawn may be too perfect. But he is compelling.